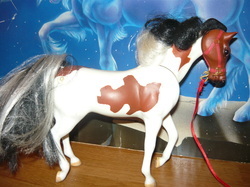 Velvet Heir-1973 palomino tobiano. Sired by Million Heir (r), out of Yellow Velvet (r) (QH). Flying Dun Diamond-1980 red dun frame overo and sabino. Sired by Flying Fawago (r), out of Like A Diamond (QH). Skip New York-1983 chestnut dun. Sired by The New Yorker (r QH), out of Easter Skip (r). Bred by Shadow Wolf Stables. 1988-Esenica, bay dun tobiano American Azteca filly (X Ocle -PRE) o/b Shadow Wolf Stables. 1998-Maze, grulla tobiano American Warmblood filly (x Labyrinth) o/b Shadow Wolf Stables. 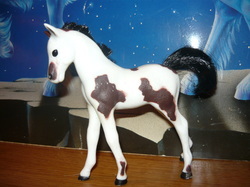 Miss Gambling Moon-1983 black splash. Sired by Gambling Man (r), out of Go Miss Moonbug. Bred by Shadow Wolf Stables. Frost Date-1983 black roan frame overo. Sired by Buck Mccue (r), out of Easy Frost (r). Cherokee Honey-1983 brown tovero. Sired by Cherokee Siemon-r, out of Honey Bear-r.
Boots Blue Willow-1988 black roan frame overo. Sired by Blue Cowboy Boots, Wind Willow. Bred by WMHS. 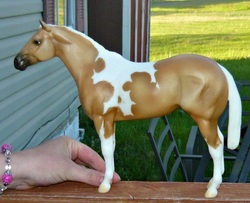 Mocha Doll Mine-1988 buckskin tobiano. Sired by Tivio Mine, out of Uvulde Mocha Doll. Bred by WMHS. 1994-My Mocha Dream, buckskin tobiano colt (x Sierra Dreamin) o/b S. Kroese. Cherokee Blue-1989 brown tovero. Sired by Blue Max-r, out of Cherokee Honey-m. Shown here as a young foal. Max's Honey-1990 brown tovero. Sired by Blue Max-r, out of Cherokee Honey-m.
Bar U Delta-1991 bay silver frame overo and splash. Sired by Bar U Stinger, out of Delta's Gunsmoke. Bred by Shadow Wolf Stables. 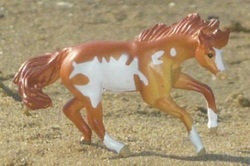 Delta Express-1993 palomino tobiano. Sired by Zan's Hot Spark (QH), Delta Diamond. Bred by Shadow Wolf Stables. Smokin Cash-1995 chestnut splash, sabino and rabicano. Sired by Smart With Cash (QH), out of Delta's Guinsmoke. Bred by Shadow Wolf Stables. 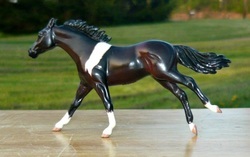 Zombie Dancer-1996 black tovero (frame, tobiano and sabino). Sired by Mr Far Verse (r), out of Ima Artist (r). 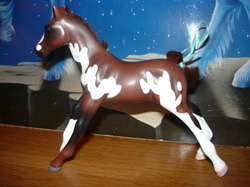 Uvalde Delta-1997 chestnut dun tovero (tobiano and frame). Sired Uvalde Smoke, out of Delta Diamond, Bred by Shadow Wolf Stables. 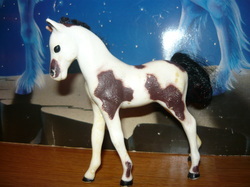 Pocket Cash-1997 bay tobiano. Sired by Cutting For Cash-r, out of Ms Suzanna Tevette-r (QH). Some Kinda Delta-2000 chestnut splash and rabicano. Sired by Kinda Cat, out of Selta's Gunsmoke. Bred by Shadow Wolf Stables. O Dat Herb-2001 bay tobiano. Sired by Figure, out of Osagelamb (r). CM Breyer SM running TB mare by Deb Vince. 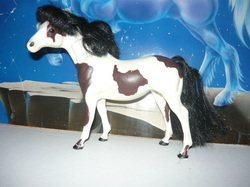 Zip My Invite-2003 bay tovero (tobiano and frame overo). Sired by Special Invitation (r), out of Hug Me Zippo (r). Royal Blue Delta-2004 bay roan frame overo and splash. Sired by Royal Blue Roulette, our of Delta's Gunsmoke. Bred by Shadow Wolf Stables. KSW Voltage-2011 liver chestnut frame overo & sabino. Sired by Watta Rocki Mount-r, out Lady Metal (QH). 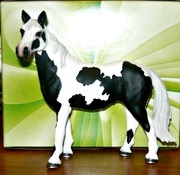 Cassie's Lucky Strike-2013 buckskin tobiano. Sired by Pegauss Stargazer-r, out of Delta Bar Liz-r.